Things are made every day for a specific purpose, but sometimes that thing finds it has a different calling. It isn’t like the others. It wants something more, something better out of life. Then every now and then, a shopper sees this something yearning for something more and gives it a chance. Take this cookie jar for instance. It didn’t want to be just a cookie jar. Nope. It wanted something more exciting and I gave it that chance. It now has a purpose of holding my daughter’s beautiful hair bows, hair clips, and headbands (aka hair candy). 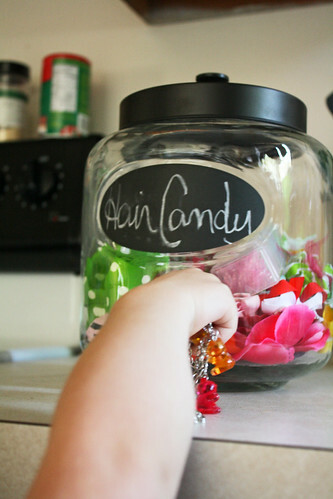 Sometimes the little one gets caught with her hand in the hair candy jar too! 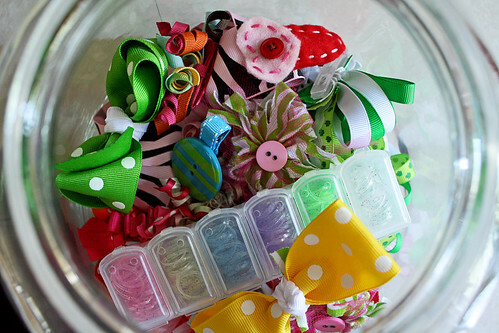 Not all hair clips made it into the jar though. These are a baby present soon to be given away. 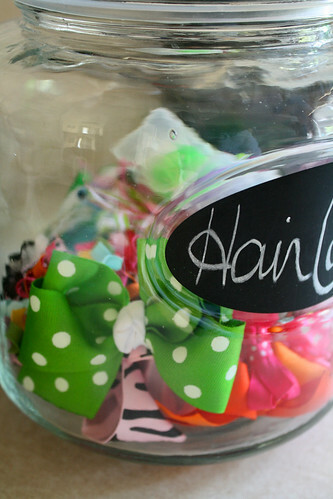 But maybe, if they are lucky, one day they too will find a home in a hair bow jar. hair candy! i love that name! so true,…. hair candy! I love al those cutie wuty things for girld hair…. What a great idea. With two girls…I may just have to try this at home!! 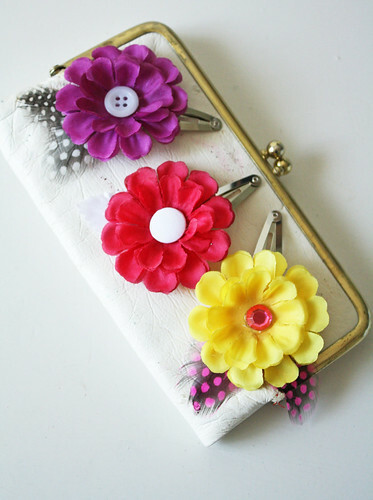 The hair clips are sooo cute! That is such a cute idea. Now I need to find a cookie jar as cute as yours. But can I ask you a question? Where did you get the elastics? I used to buy that kind all the time (I have 3 girls so we go through them quite fast) but now I can’t find them anywhere!!! So cute! Avery would need a five gallon bucket though I think lol! 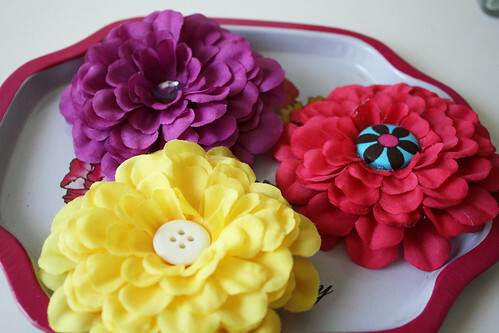 I love the flower clips you made! SO Cute! 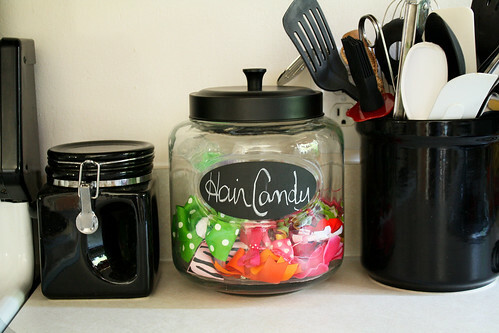 I LOVE that jar and I’m a huge fan of chalkboard paint! I never thought of using a vitamin box to store all those tiny rubber bands that otherwise get all over my bathroom. What a simple, easy fix! I bought these at Walmart. They are my favorite by far. I used to buy some from the Dollar Store, but these are much more heavy duty. Hi! Just found your blog and I think it’s great! My name is Jessica, I live in Jacksonville, and I have a 2 yr old daughter too! How interesting! 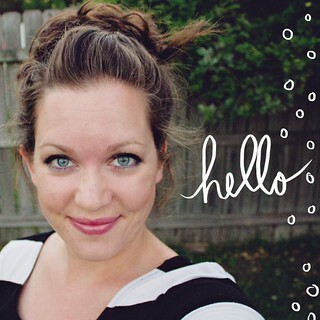 I love your ideas and will be following your blog! I think I might just steal this to keep my own hair paraphernalia in one place! Great idea.